"No better-sounding way to play CDs here and now." As my writing here at SoundStage! can prove, I am a committed tube audiophile whose reference system is also all digital. So imagine my interest after reading Doug Schneider's very enthusiastic review of the Zanden Model 5000 Mk II DAC, which uses five tubes and won our Aesthetics & Sound award for 2002. To see this DAC is to want to hear it, and as Doug's review pointed out, to hear it is to want it, period. So I was more than a little interested in auditioning the new Zanden Model 5000 Mk III DAC as a prelude to reviewing the Model 9500 mono amps and Model 3000 preamp I saw and heard at CES. Like its predecessor, the Model 5000 Mk III is an unconventional design for these digital times. It's a purely 16-bit/44.1kHz DAC that does not upsample and will not decode 24/96 data. It also has a tube output stage and tube-rectified power supply along with a proprietary analog filter that designer Kazutoshi Yamada claims preserves the phase integrity of the signal better than any alternatives, analog or digital. The Model 5000 Mk III's final throw-back design element is the use of discontinued Philips TDA-1541A Double Crown DAC chips, which Mr. Yamada considers superior to any DAC currently made. There is also no denying the beauty of the Model 5000 Mk III. If a DAC has to cost $9800, it certainly looks the part. But there is something new about the Mk III version of the Model 5000 DAC. The circuit and its technology remain unchanged, but the Mk III makes use of a patent-pending material called Safety Wave to cover the DAC chips, clocking circuit, and tube sections. This is said to eliminate digital noise from propagating inside the DAC as well as outside noise, most likely from the power line, from affecting the Model 5000 Mk III's circuitry. The material, invented by Non-Destructive Inspection Co., Ltd. of Osaka, Japan, is made of a special alloy presumed to be part aluminum. It comes in very thin sheets of less than .2mm thickness but is said to provide the shielding of 30mm-thick aluminum. Zanden reportedly has exclusive rights to use it in audio products, including in soon-to-be-available interconnects, power cords, and a digital cable. Owners of Model 5000 Mk II DACs can have their units Safety Waved for $300. Contact Zanden Audio for details. In terms of its sound, the 5000 Mk III reminds me of three of my favorite digital components -- no small feat. It has the high-frequency purity of the Mark Levinson No.390S CD player (though not quite its bass power and overall incisiveness), the easy-on-the-ears nature of the Bel Canto DAC2, and especially the poise and rhythm of the 47 Labs 4713 Flatfish/4705 Progression combo. The Model 5000 Mk III unravels music with high resolution, but its powers go beyond the simple reproduction of individual sounds to more elusive qualities. The music is propelled along in a wholly balanced and satisfying manner, and it displays no mechanical or analytical pallor. It's truthful and beautiful. Dave Moore's Breaking Down to 3 [Red House RHR CD 132] is a collection of swinging, bluesy folk music, and I distinctly remember listening to it from beginning to end with the Zanden DAC in my Lamm/Wilson Audio reference system. Later on, I listened to the same disc over a Mark Levinson No.383 (still my favorite integrated amp) and Magnepan MG1.6/QR speakers, and its sound was just as attention grabbing, so I listened all the way through again. What a wonderful collection of songs Breaking Down to 3 is, beginning as it does with "Mr. Music," Moore's invocation of the muse to carry him through the rest of the disc. This is what the Model 5000 Mk III does -- causes music to resist analysis and instead command full listening attention. And it does so without your even knowing it -- all of a sudden a disc is finished, and you're looking for another to play. And curiously, with the Model 5000 Mk III decoding the bits, the Magnepan/Levinson system was nearly as satisfying to listen to as my big rig. Yes, the Zanden DAC elevated the performance of this system that much. There are a few things to keep in mind with the Model 5000 Mk III, however. It has an uncommonly low 1V output, so if your system is wanting for gain (perhaps because you use a passive preamp), this DAC will only exacerbate the problem. Also, you should partner this DAC with a high-quality transport -- the best you can find, in fact. I used two different DVD players, and while both were fine, you don't want to pay almost $10,000 for a DAC and have it sound "fine." A Mark Levinson No.37 transport was far superior, passing along incomparable amounts information, which the Model 5000 Mk III made the most of. Finally, I achieved the best results with a very neutral BNC-terminated digital cable: the i2Digital X-60. No supposed complementary colorations need apply. You'll want to get all the unadulterated digital data you can to this DAC. Also, if you listen to a steady diet of easy-to-reproduce music -- solo wood block, or steel drum and dulcimer (hey, some people do like this stuff) -- you will be wasting your considerable money on the Model 5000 Mk III. Oh, it will decipher such recordings with consummate realism, but it won't be breathing hard doing so, and lesser DACs that are also far less expensive can reproduce such sound effects in impressive fashion. Why drive a Ferrari to the corner store when a Ford will get you there too? Pull out some orchestral recordings or full-on rock'n'roll or large-ensemble jazz to hear the Model 5000 Mk III in all its glory. It will reproduce such music with great sophistication, and you'll know instantly what all the hubbub is about with this DAC. Yes, SACD and DVD-A are here and growing in stature, but one of the most coveted features of universal audio/video players is audiophile-approved CD playback. After all, we all have large CD collections that we plan to continue to enjoy -- and even add to. I know of no better-sounding way to play CDs here and now than the Zanden Model 5000 Mk III DAC connected to a top-flight transport. And if you want SACD and DVD-A playback, your preamp does have more than one set of inputs, doesn't it? 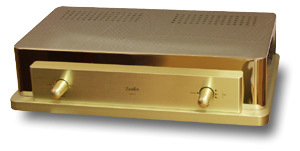 Zanden's advertising for the Model 5000 Mk III states that it's "probably the world's best DAC." Well, it's the best DAC I've heard -- no "probably" about it. If you can afford the Model 5000 Mk III and have a CD collection that will put it to good use, you should hear this gleaming jewel. The Model 5000 Mk II was a Reviewers' Choice last year, and so is the Mk III this year. Warranty: Two years parts and labor (90 days on tubes).